The rhythm of our Muirfield life is governed by Mom’s daily status, meal times, Jeopardy, and nursing shift changes. 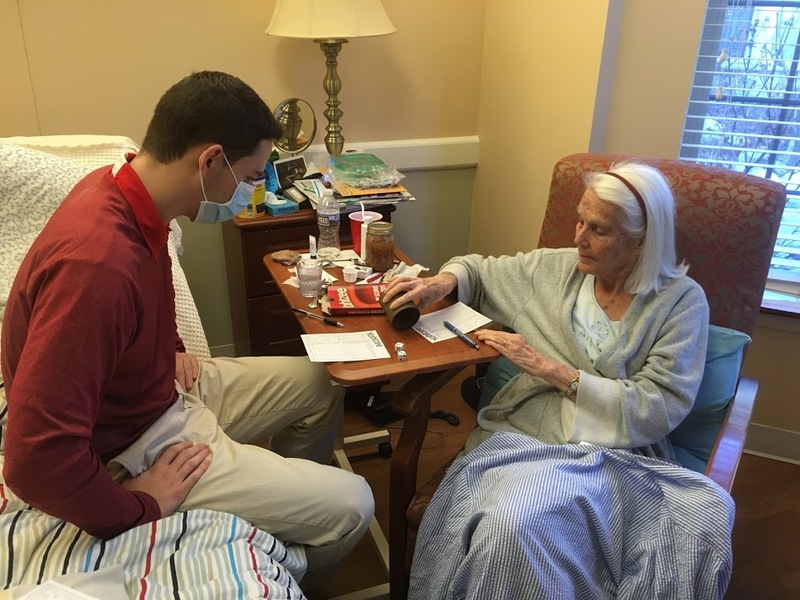 Within our green-carpeted cocoon, we are blessed with a rotating schedule of competent, caring aides and nurses guided by their mission to keep Mom comfortable. Tiny Carole with close-cropped curly hair and her love of animals. Affectionate, kind-hearted Megan who weeps to see Mom suffering on bad days. And Deb, with her wavy, long, blond hair and artfully made-up almond eyes, our friend and Mom’s particular champion. After being here three weeks or so, Mom asked for Hospice, believing the organization would send angels of death who would help her cross over more quickly. Not the case we learn, but dear Dan, a social worker, and sweet Jess, the team nurse, prove additional advocates for Mom’s comfort and eventual release. Most surprising, according to Dr. Spitzer who has seen her scans, Mom has experienced minimal pain. This has frustrated her as she sees pain as the means to more morphine, and morphine as her ticket out. While she encouraged my father to lie about pain levels to win increased doses when he was dying, she cannot bring herself to do so. 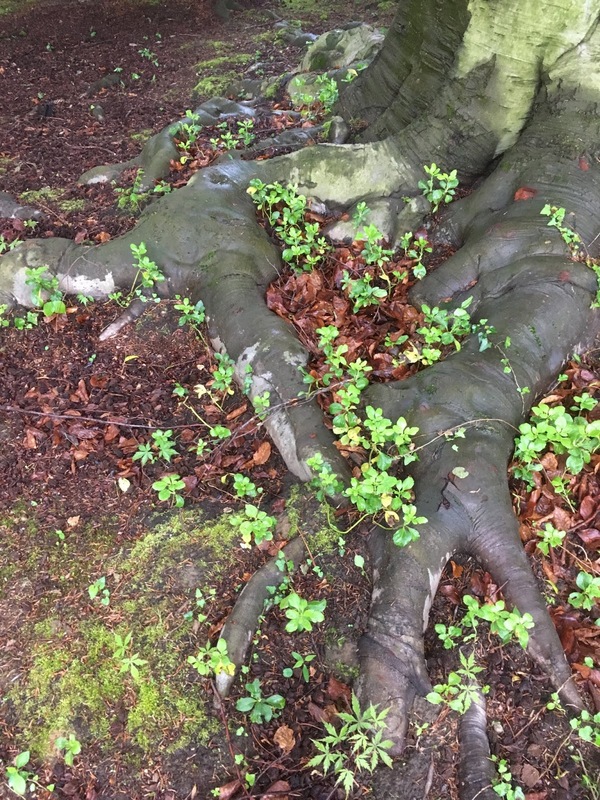 Then, during a recent phone call to a childhood friend, she was chatty and cheerful while reporting, “The pain came – as wanted – this morning.” She felt her request for a boost in morphine was legitimate when Jess checked in that day. Jess also repeats what Dan and Dr. Spitzer have made clear to Mom before. “You are in charge, Mimi. You can eat whatever you want. We can bring in music or arrange a massage. You can also choose to refuse food and drink. Everything is up to you.” These people are a gift to give Mom a sense of power when so little power remains. My sisters and I follow Jess out to the hall where we run into Dr. Spitzer. The two confer about Mom’s condition and the increase in dosage. Deb happens down the hall in the course of her rounds and joins our huddle. Unlike Jess, Deb has been with us during Mom’s bad days. She has seen her eyes squeezed shut, jaw clenched, as she’s fought to stay stock-still to quell nausea and vertigo. “She’s anxious,” Deb says. “Attavan would ease that.” There’s discussion, note-taking, and general agreement. When Deb is on duty, all is well. Mom’s not ready to refuse meals, and at Muirfield, that would be hard to do. The food is amazing. Each morning, she receives three-page menus for the following day. One of us reads them aloud, and, while it’s Mom choice, we all voice opinions. Tomato aspic with a dollop of mayo is a given, for lunch and dinner. Mom loves it and doesn’t have to share; certainly no one else is seeking bites. Beyond that, hmmm. A group effort. Chicken crepes with champagne mushroom sauce or curried lamb? A side salad of mandarin oranges, walnuts, bibb lettuce and bleu cheese? Oooh… fried oysters! I love them! Add that. Francie lingers over the thought of edamame. Yes. Add that too. When the tray arrives the next night, heavy with Mom’s choices and our additions, Mom’s appetite is robust… and she eats it all. Oh. Well, that’s okay! That’s great. Glad she enjoyed them. “Like what?” Deb asks, and we tell her. She chuckles, checks Mom’s vitals, and leaves. Ten minutes later she returns with a hot platter piled high with fried oysters and edamame. “You know I’ll take care of you,” she says with a smile. We feel it so fully, from Deb and the others. They minister to Mom with medical skills and gentle strength, respecting her dignity, moving her carefully when she’s too weak or too sick, cheering her on when she feels well, easing her way when that time has passed. And through the weeks, they look after us too. With hugs, information, humor, and sympathy. With a gentle hand on the shoulder, a tissue when needed…. And even with oysters and edamame. Francie and Mom are Jeopardy regulars and at 7:00 PM, they lean forward as if at a starting gate. Mom squints in concentration. Francie nails a lot of answers and never forgets to frame them as questions. I rarely know anything and on the rare occasion I do, (so pleased and proud!) I forget the question format and am chastised for leaping in and doing it wrong. Ah, well. After Jeopardy, we help Mom settle down for bed. She takes out her hearing aids, “my ears”, removes her headband, and places it on the bedside table within easy reach. We turn out the lights, kiss her goodnight and then two of us head out, never sure of what the morning will bring. My sisters and I have started to take shifts for early morning, and in the late evening, we take turns waiting for one of our night angels, Amina or Abby. Mom has insisted that we go home and get some sleep, and to allow that, Muirfield has set us up with these extraordinary women. Kind, gentle, and respectful, both come to care deeply for Mom… and, it seems, for the three of us too. When I have the late shift, I linger to chat with whichever aide arrives. Both are in their late twenties. Abby is slender, studious, and soft-spoken with the lilt of the islands. When I am not distracting her with whispered conversation, she hunches over her school books by the dim light from the partially open bathroom door in order to study for her courses in nursing. Several times during the day when my sisters and I are on our way to the cafeteria for lunch, we’ve run into Abby in the hall caring for other patients even after she’s spent the night with Mom. “Omigod! You’re still here! When do you sleep?” we exclaim. On top of school and shifts at Muirfield, she’s a single mother who is deeply grateful for her mom’s help in babysitting for her young son. We share pictures of our children and little Paul. 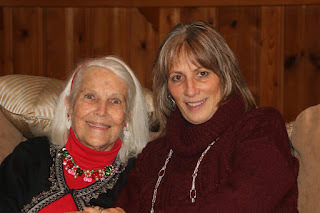 I have also shown her, and the nurses we are close to, pictures of Mom in her youth and even a few from Christmas when Mom seemed well and none of us could have imagined what was ahead. As much as they have witnessed Mom’s grace and courage, I want them to have a sense of her as a vibrant, active person with a life beyond these walls. With her streaked blond hair, vests, and slim-fit jeans, Amina is stylish, feisty, and funny. She has strong opinions and a strong body, which is crucial as Mom grows weaker. And thanks to Abby and Amina, I feel I can go home to bed at 638. On the nights when Dave stays in Easton, Francie and Matt have urged me to stay in their snug guest room with its mermaid posters and Disney decorations. The bed there is irresistibly cozy with an electric blanket and innumerable pillows. The adjacent bathroom would be all mine… and I love staying there. But I know my nights at 638 are coming to an end. It’s home, and I want to stay there while I can. 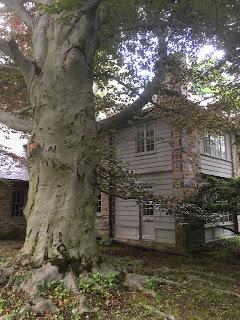 It is well after dark when I pull in, driving over the sinuous black shadows of the limbs of the copper beech, the centuries-old tree that stands guard over the house. 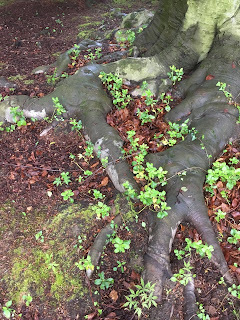 I park, then head back to the tree, stepping gingerly to avoid the expansive root system that stretches through the soil behind the house, breaking through the surface like dinosaur toes. I spread my arms wide to embrace the trunk, laying my cheek against smooth, cold elephant skin. “I love you copper beech,” I whisper, as I have so many times before. “I hope the next family loves you as much….” Tears spill over and I wish I could feel a tremble of response, or attribute the rustle of leaves to something more than a passing breeze. Oh, I will miss the refuge of this house and the protection of this massive being. But, I am grateful… for everything. Mom’s wonderful, long life and my own. My father. My sisters who have shared that life and shouldered this painful time with me. This house and this tree. My Dave and our kids. For Deb, Megan, Carole, and Dr. Spitzer who have blessed us all with their care and compassion through this final wait with Mom. Mom’s breathing is audible, with a hint of a rasp, but not quite a snore. Francie brought in a comfy blue and white striped quilt that is snugged up close to Mom’s chin. She is still as a mummy, but sleeping peacefully after a wretched morning of nausea and vertigo. Thank god for the medications that soften such miseries, but looking at her now, I can believe this is actually happening. Mom has moved to Muirfield, a healthcare center four minutes from 638, the house she has lived in for over 50 years, the house I think of as my third parent. Her room here has a wide bay window now brimming with yellow and white roses, lavender hyacinth, top-heavy sunflowers, and graceful orchids. Much as she’d hoped to slip away without fanfare, word has gotten out about Mom’s illness. I can only imagine how hard it is for her friends to grasp that mom - vibrant, beautiful, active Mimi – is the one dying. In this, I’m grateful that it’s Mom’s turn to go. It’s been brutal for her as dear friends have passed, and I can’t imagine the depth of her grief if she’d had to face the passing of her remaining cherished friends. Until this morning, Mom has had three good days in a row. She was able to dress in a turtleneck and slacks, and sit up in a chair. Her hair was brushed, silvery, and lovely, swept back in a headband, as always. This was important to her as two of her grandchildren, Casey and Campbell, were here for the weekend, and Mom wanted to be the Greemie they know: chatty, cheerful, and interested in every minute detail of their lives. Casey gave Mom a much-needed manicure and let the time linger as she held Mom’s hands, massaging them with Vaseline Intensive Care Lotion in the yellow bottle, a longtime staple in the medicine cupboard at 638. Campbell and Mom played Yahtzee, hooting, as they are wont to do, over every full house and large straight. When Mom was back in bed, Casey snuggled up close. Mom is actually not one for snuggling, but with Casey, it has always seemed natural, and my daughter, who thought this might be her last visit with her Greemie, was holding on to Mom as much as she was holding on to her hand. “Are you scared, Greems?” she whispered. I hope Dad is hovering, unseen, nearby. Maybe Byeo and Poppy, Mom’s parents? Perhaps Uncle Ding? Might they all be here, perched on her bed, or surrounding us as we sit in our portable sling chairs? Are they waiting for her, urging her on, excited to get her back as much as we dread losing her? “Oh Mom, I hope they’re planning a party to welcome you to the other side!” I whispered one night while we held hands in the dark. “They better be!” she said, and we laughed. But oh, I want it to be true! Rita’s nails are painted green, and news anchors on the TV mounted on the wall at the foot of Mom’s bed are abuzz with projections. The police have smeared the lampposts in the city with hydraulic fluid to discourage fans undaunted in the past from shimmying up when plain old grease was the deterrent. Fans’ “irrational exuberance” is a municipal concern as the Philadelphia Eagles face the New England Patriots for their first shot at a Super Bowl win in decades. Brash of him given the hype, Dave is wearing his Patriots jersey and fends off much good-natured ribbing as nurses and aides stop in to check on Mom and take a look at the score. A synchronized murmur resounds through the hall as every TV is tuned to the same channel for the game. Mom’s room is crowded with folding sports sling-chairs we’ve brought in to supplement Muirfield’s two comfortable, upholstered wingbacks. The chairs themselves – in jewel tones of burgundy, green, and royal blue – add a certain festivity to the room. Shopping bags brimming with potato chips, pretzels, and cheese popcorn loiter against the walls. A cooler holds wine, beer, humus and cheese. Could be a playoff party anywhere. We pull up a Saturday Night Live YouTube skit portraying the colonial rivalry between those annoyingly successful New Englanders and the cocky folks from Philadelphia and watch it twice. Hysterical! But to me, the game itself seems endless. All those time-outs! Thank god for the commercials. When everyone else loses interest because the game is suspended, I perk up because the commercials are funny. I’m not a football fan, and no matter how many times the rules have been explained to me during drunken fogs at college or currently, while Dave watches his Patriots, I just don’t get it. But Mom knows this game is historic and although her eyes are often closed, she insists on “watching” to the end. When the Eagles win, a riotous hubbub rumbles down the halls, while whistles and firecrackers ricochet through the neighborhood outside. Rita has a boyfriend. It's been years since my sister dated and long ago she reached the point where “I do NOT want a man in my life!” Apparently her guy, Bill, has heard this refrain more than once. Dear Bill. He came into my sister’s life, into all our lives, at just the right time. As it turned out, Drew and Rita’s friend were not a match, but Bill and Rita were. By the night of her party, her friends and sisters had heard the lilt in her voice, and had seen the sparkle in her eyes we thought had disappeared for good. We couldn’t wait to meet him and as excited as we were, poor Bill faced a gauntlet of eager faces and quivering antennae as we all tried to make sure he was the dear man Rita thought he was. Since then, he has been proving himself to be so as he joins our men in being support staff for us and for Mom. In the weeks of waiting, Rita’s basement flooded. Bill met with the Service Master people so Rita could be with Mom. When Dave and Matt, the extraordinary chefs Francie and I married, leave Muirfield early to cook sustaining and sumptuous dinners for us at 638, Bill joins them in the kitchen. (We are now enamoured of his shrimp with spicy chipotle sauce.) And best of all, when Rita leaves us at night to go home, she doesn’t return to an empty house. “Not like when Dad was sick,” she says ruefully. In fact, we think it’s possible Dad orchestrated their meeting from the other side. 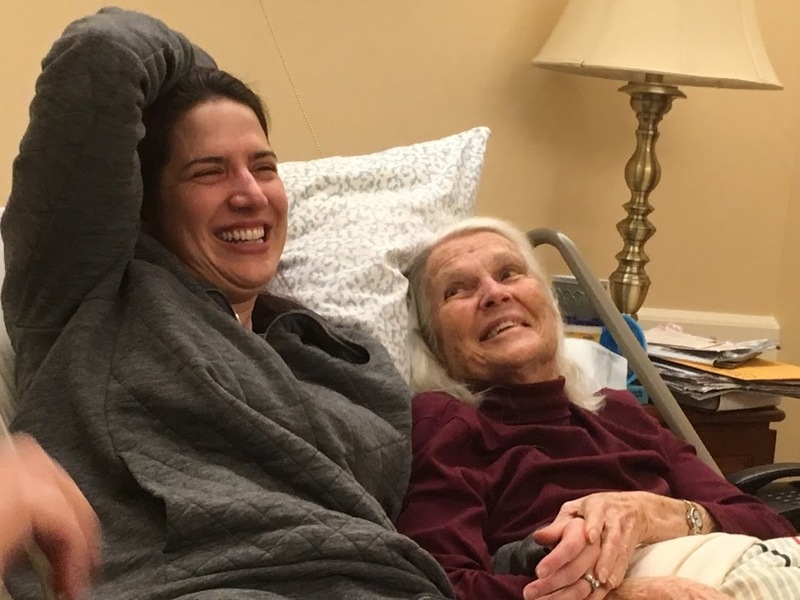 While at Mom’s bedside, nothing gives us greater joy than teasing Rita. All we have to say is, “So, how’s Bill?” and her eyes brighten, a little flush creeps to her cheeks, and a grin she cannot suppress suffuses her face with light. So good for our saddened souls. On the day of The Meeting, Mom makes a big effort to get out of bed and get dressed. She wears gray slacks, a maroon turtleneck and, of course, a matching headband. She looks beautiful and expectant, ready to meet this man who is making her daughter happy in the midst of deepest sorrow. It's a chatty, companionable visit. Mom clearly relishes the exchange and obviously likes Bill. Mom has always been a master at coaxing out her listeners’ interests, and Bill hits the right chords of warmth and concern without getting into painful territory. He times his departure well, and Rita walks him to the door. When she returns to us, she is beaming, so proud of this dear man, so grateful that Mom has had the chance to meet him. And then, she bursts into tears. That is how it has been for us… a welter of emotions running close to the surface, leaking out in a mix of laughter and tears.